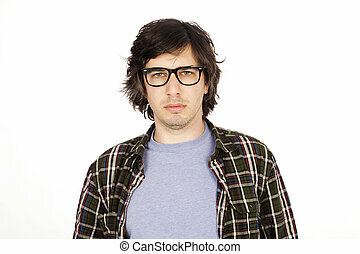 Caucasian male in his early 30's dressed in a casual attire, apparently looking at the camera through his sunglasses with a serious expression. Isolated on white background. 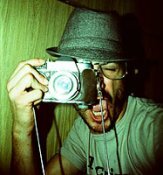 Caucasian male in his early 30's dressed in a casual attire, apparently looking at the camera through his sunglasses with a large toothy smile. Isolated on white background. Caucasian male in his early 30's dressed in a casual attire and holding a blank white sign with one hand, apparently looking at the camera through his sunglasses with a toothy smile. Isolated on white background. 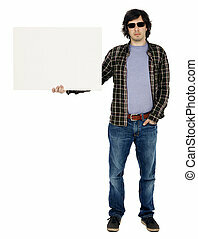 Caucasian male in his early 30's dressed in a casual attire and holding a blank white sign with one hand, apparently looking at the camera through his sunglasses with a serious expression. Isolated on white background. Caucasian male in his early 30's dressed in a casual attire and holding a large blank white sign, apparently looking at the camera through his sunglasses with a toothy smile. Isolated on white background. Caucasian male in his early 30's dressed in a casual attire and holding a large blank white sign, apparently looking at the camera through his sunglasses with a toothless smile. Isolated on white background. Caucasian male in his early 30's dressed in a casual attire, looking at the camera with a serious expression, hand in pocket of his jeans. 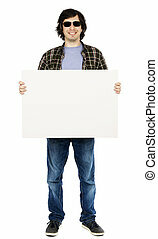 Caucasian male in his early 30's dressed in a casual attire and holding a blank white sign and looking down at it. Isolated on white background. 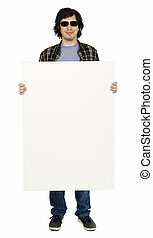 Caucasian male in his early 30's dressed in a casual attire and holding a large blank white sign, looking at the camera ith a toothlessle. Isolated on white background. 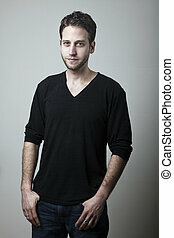 Caucasian male in his early 30's dressed in a casual attire, looking at the camera with a serious expression. Isolated on white background. 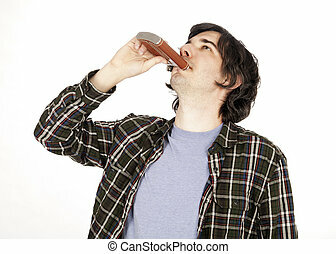 A caucasian male in his early 30's dressed in a casual attire, tilting his head up and drinking from a hip flask. Isolated on white background. 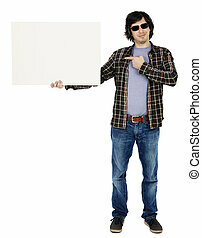 Caucasian male in his early 30's dressed in a casual attire and holding a blank white sign with one hand while pointing at it with the other, apparently looking at the camera through his sunglasses with a toothless smile. Isolated on white background. 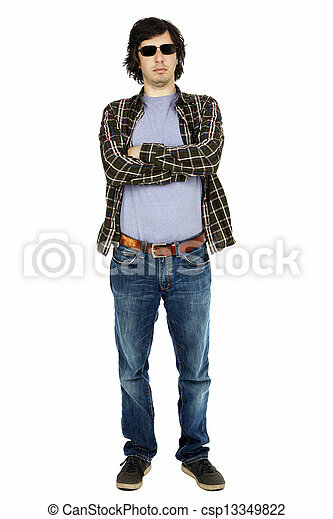 Caucasian male in his early 30's dressed in a casual attire, looking up and laughing hard, hand in pocket of his jeans. An adult caucasian man at his early 30's wearing casual sneakers, a pair of blue jeans and a hoodie over a black t-shirt. He's looking at the camera with a serious and somewhat tiresome gaze. Isolated on white background. An adult caucasian man at his early 30's wearing casual sneakers, a pair of blue jeans and a hoodie over a black t-shirt, and holding a rolled cigarette/joint in his hand. He's looking at the camera with a serious gaze, as if in the middle of speaking. Isolated on white background. An adult (early 30's) black haired caucasian woman, wearing a dotted shirt and a dark jeans skirt looking down with a somewhat melancholic expression and posture. Isolated on white background. An adult (early 30's) black haired caucasian woman, wearing a dotted shirt and a dark jeans skirt looking at the camera with a toothy smile and her arms raised in thumbs up motion. She is very satisfied. Isolated on white background. An adult (early 30's) black haired caucasian woman, wearing a dotted shirt and a dark jeans skirt looking down with her hands on her hips. Isolated on white background. An adult (early 30's) black haired caucasian woman, wearing a dotted shirt and a dark jeans skirt looking at the camera with a toothy smile and her hand raised in thumbs up motion. She is very satisfied. Isolated on white background. 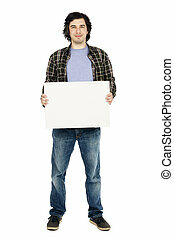 An adult caucasian man at his early 30's wearing casual sneakers, a pair of blue jeans and holding a large blank white sign. He's looking at the camera with a goofy expression. Isolated on white background. 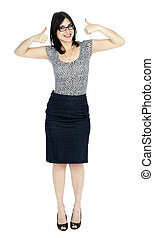 An adult (early 30's) black haired caucasian woman, wearing a dotted shirt and a dark jeans skirt looking at the camera with a large toothy smile while raising her arms up high. 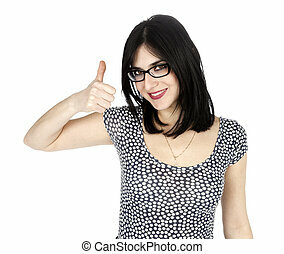 She is very satisfied by success. Isolated on white background. 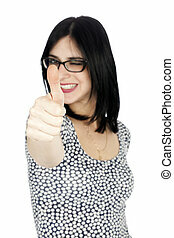 An adult (early 30's) black haired caucasian woman, wearing a dotted shirt and a dark jeans skirt winking at the camera with a toothy smile and her hand raised in thumbs up motion. She is very satisfied. Selective focus on the thumb in the foreground. Isolated on white background. Medium shot studio portrait of a caucasian adult man in his early 30's over gray background. He seems to be in a good mood, looking at the camera with the hint of a smile. Studio portrait of a caucasian adult man in his early 30's over gray background. 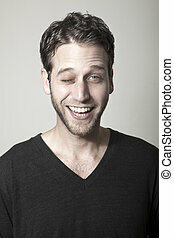 He seems to be in a good mood, foolishly winking at the camera with a large toothy smile on his face. Waist up view of an adult Caucasian woman in her early 30's, wearing a casual summer dress and flip-flops, drinking a glass of water while looking at the camera with a serious expression. Isolated on white background. 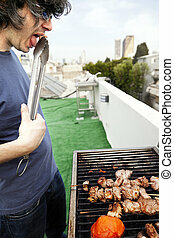 Early 30's caucasian man treating himself with some meat straight off the grill while cooking on the roof of a building in urban surroundings. An adult caucasian man at his early 30's wearing casual sneakers, a pair of blue jeans and a hoodie over a black t-shirt. 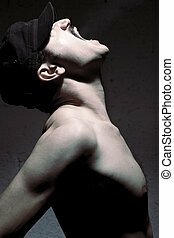 He is making a passionate licking gesture on the stand's extended pole while looking at the camera with bedroom eyes. Isolated on white background.